I think I promised you another nonsense blog, right? I’m still on a crazy deadline, although I did manage to make the move across the country (cat as carry-on & all) with only minor mishaps. Thanks to my lovely husband, who found this link for my blog, ensuring I could devote more time to my deadline. So, this article briefly discusses the discovery of new microorganisms which scientists have named – officially – after Cthulhu. And if scientists are going around naming things Cthulhu, isn’t it about time Word stopped flagging it as a spelling error? I suspect HP Lovecraft had something a little more sinister in mind…. 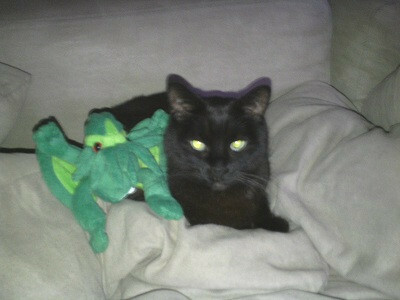 And this below, is when Cat meets Cthulhu (thanks to Think Geek you, too, can have your very own Great Old One). Yes, this is the same cat we took as carry-on luggage for a 5 hour flight. The carrier was so much smaller than her normal one, we started calling her the veal cutlet for the weeks leading up to the move. And even now, when we talk about putting her in the carrier, we say “we need to cutlet the cat”. Because hubby and I are both crazy in complementary ways. Next time, I promise a real blog, when my brain isn’t totally fried! Glad Cat made it, and you guys, too!